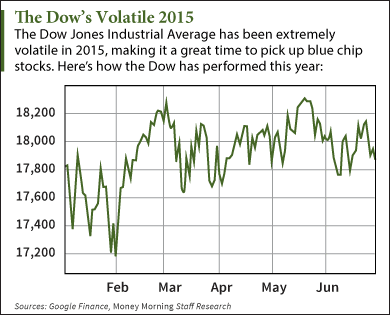 The Dow Jones Industrial Average has been extremely volatile in 2015. Through January, the index fell 3.7%. In February, it climbed more than 5%. In May, the DJIA hit an all-time high of 18,351. Today (Monday), the index is back below 17,700 after falling more than 240 points. Blue chips are the stocks of well-established companies with multibillion-dollar market capitalizations. They're internationally recognized and leaders in their respective industries. Blue-chip stocks trade on major exchanges like the Dow Jones Industrial Average, the S&P 500, or the Nasdaq 100. Blue chips are stocks of well-established companies with multibillion-dollar market capitalizations. They're internationally recognized and leaders in their respective industries. Most are household names. Blue-chip stocks have very strong earnings, revenue, and margins. This makes them some of the most stable investment opportunities on the market. During market corrections, or even recessions, blue-chip stocks hold their value better than other stocks. One of the biggest benefits of investing in a blue-chip stock is blue chips are less susceptible to market swings than small- or medium-cap stocks. These are companies that consumers and industries cannot live without. These stocks will maintain their wealth better than any others when panic hits the market. Blue-chip stocks are also best for investors who want to buy a stock and hold it for five years, 10 years, or longer. They're not great for day traders because there won't be as many extreme price swings as smaller stocks see. Another benefit of blue chips is they typically pay healthy, consistent dividends. Many increase their dividends regularly and make payouts for decades. This lets investors collect income even if share prices pull back. A couple of the most popular blue-chip stocks on the market are Procter & Gamble Co. (NYSE: PG) and McDonald's Corp. (NYSE: MCD). PG is a $214 billion conglomerate that's a worldwide leader in consumer packaged goods. MCD is worth $93 billion and is one of the most recognizable brands in the world. They both pay dividend yields near 3.5%. When investors talk about blue-chip stocks, they are usually the first two mentioned. But we've got another blue-chip stock that offers a bigger profit opportunity. Why This Blue-Chip Stock Is a "Must Own"
Apple Inc. (Nasdaq: AAPL) "officially" became a blue-chip stock when it was added to the Dow Jones Industrial Average in March. In 2015, AAPL is up 13.7%. It has climbed 36.4% in the last 12 months. Despite those gains, AAPL stock still has plenty of upside. "I think we still have a lot of momentum left on this stock," Money Morning Defense & Tech Specialist Michael A. Robinson said on FOX Business in March. "I have a $142.85 target on this for Labor Day 2016." Money Morning Chief Investment Strategist Keith Fitz-Gerald has an even higher price target for this blue-chip stock. He sees it climbing to $200 in the next two years. That would be a gain of 59.4% from today's opening price of $125.46. The reason our experts are so bullish on AAPL is the company's tech "ecosystem." This isn't just a computer and mobile phone company. The company has recently unveiled Apple Music, the Apple Watch, Apple TV, and the payment service Apply Pay. "It's the best tech ecosystem on the consumer level in the world today," Robinson said. "Really, nothing comes close." "Apple has a huge addressable market that's not yet been tapped and not yet been recognized by the broader stock market," Fitz-Gerald said. "That's what investors ought to be keying in on." Apple has some of the highest margins in the industry, with an operating margin of 30.2%. In the upcoming quarter, AAPL is expected to post revenue of $48.58 billion. That would be a year-over-year increase of almost 30%. The company has a market cap of $722 billion. If AAPL hits Fitz-Gerald's price target, it will be the world's first $1 trillion company. "They are such a juggernaut," Money Morning Technical Trading Strategist D.R. Barton said in February. "If you're a money manager and you don't have Apple in your portfolio, it's basically financial suicide." Apple also pays a modest dividend of 1.7%. The Bottom Line: With the markets as volatile as they have been in 2015, we recommend investing in blue-chip stocks. They will protect your investing capital, while providing plenty of upside. The top blue-chip stock to buy today is Apple stock. It's one of the best performers of 2015 and is well on its way to becoming the world's first $1 trillion company. What is this tiny $4 a share stock?